Amit Kanda, VP of Oracle (Global Strategy & Product Cloud Services) at the Fujitsu and Oracle launch of Oracle Cloud at Customer. The companies have formed a partnership to provide Cloud service to local business, Sangre Grande Room, Hyatt Regency, POS. Thursday, July 19, 2018. PHOTO BY ROGER JACOB. Cloud computing is transforming the way companies work, allowing them to efficiently and cost-effectively scale up or scale down services as needed. Cloud computing is defined as the practice of using a network of remote servers hosted on the internet to store, manage, and process data, rather than a local server or a personal computer. Describing this as a "transformational technology", president and CEO of Fujitsu Caribbean, Mervyn Eyre believes Caribbean businesses cannot afford to get left behind when the global trend is towards cloud storage. "As a Caribbean citizen, I have deep concerns about where we are in cloud adoption. I think we're far behind and a lot of it has to do with a number of things. I think one is governance issues, at the level of IT (information technology) maturity – concerns about not wanting to let go of our own environment – but that time has passed. "There's no question that this (cloud adoption) has to happen if we're going to be able to get the benefits of surviving in a digital society. That's one of the reasons why Oracle and Fujitsu are here, because we want to make that journey safer. We feel there's a responsibility we have to bring this technology to the table, to be able to build trust and confidence in public cloud technology," he said. "I think we need to get these barriers broken," Eyre added, "so that we can get the benefit of economies of scale and get the benefit of scale generally, to be able to get our businesses moving into this space to become digitally relevant." Eyre was speaking with reporters on July 19 at Hyatt Regency where Fujitsu and Oracle held a presentation about Oracle Cloud at Customer, for which Fujitsu is the sole provider in the Caribbean. This new agreement allows Fujitsu to directly provide Oracle Cloud Services to customers as part of any hybrid IT or modernisation project. 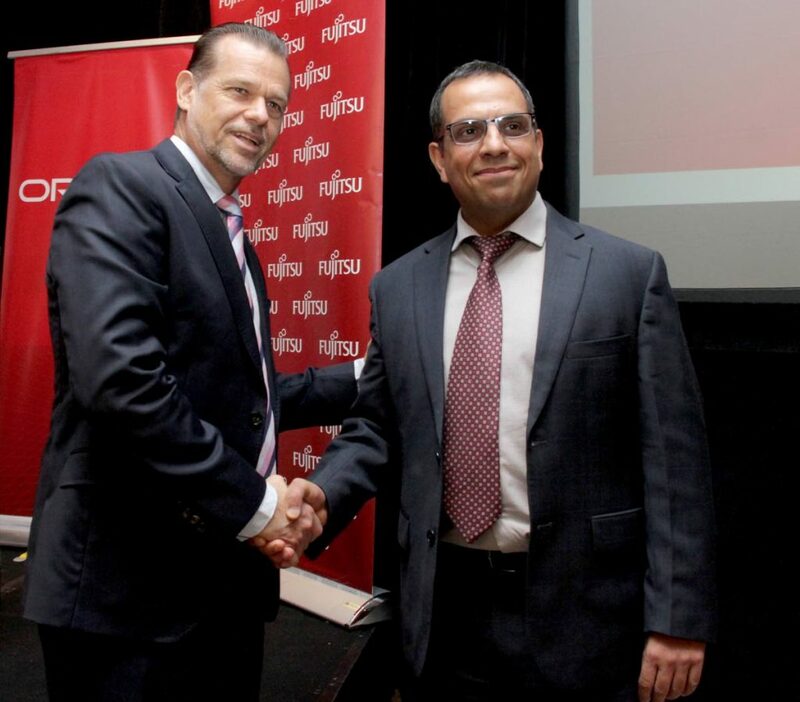 Fujitsu said under the agreement, it will deliver Oracle Cloud at Customer to public and private sector companies in TT and the wider Caribbean from its Trinidad Data Centre, with local companies having the option to install the services at their premises. This, it added, will enable "the rapid build out of multiple cloud environments and high quality multi-cloud operations" while its strategic alliance with Oracle "provides robust cloud offering to customers in the Caribbean to support digital transformation." Fujitsu and Oracle form a partnership to provide Cloud service to local business, Sangre Grande Room, Hyatt Regency, POS. Thursday, July 19, 2018. PHOTO BY ROGER JACOB. On its website, Oracle explained the benefits of this particular service. "Rather than procuring hardware, installing software and managing the system, you easily consume the same cloud services on your premises, just like you do in Oracle Cloud. Oracle Cloud Machine includes a wide range of Oracle Cloud services - Oracle Platform as a Service (PaaS), Oracle Compute Infrastructure as a service (IaaS), and Oracle Software as a Service (SaaS). You can use these cloud services as building blocks to accelerate the development of your innovative applications while maintaining complete control of your data and systems. "Operated by Oracle in your data centre for your convenience and available as a subscription, Oracle Cloud at Customer delivers the benefit of aligning spending with the revenue realised from applications. Oracle supplies the hardware, installs the software, and handles the day-to-day operations," Oracle stated. Another aspect of Cloud at Customer, highlighted during the recent presentation, is its flexible subscription pricing, also known as pay as you go. 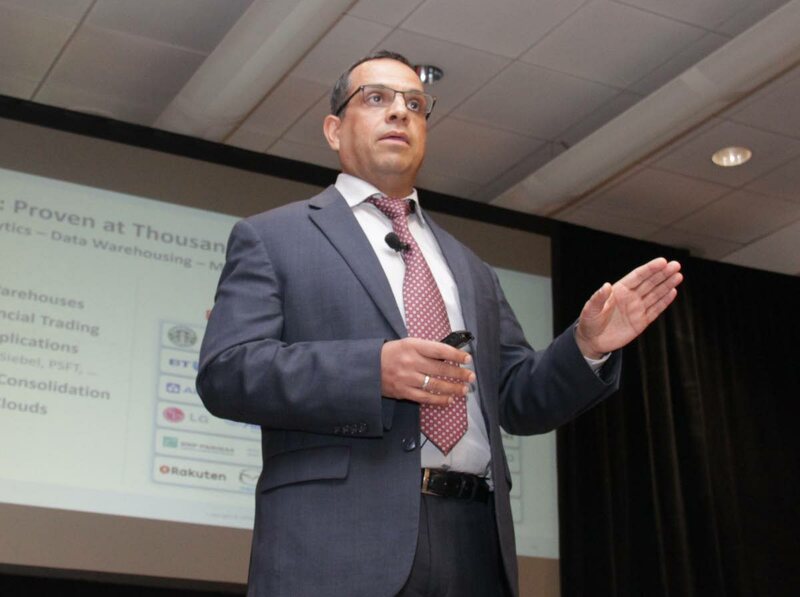 VP of Product Management at Oracle, Amit Kanda, told reporters, "When the customer builds their own environment, they have to buy the memory and the processors and the storage for their peak load, which may only happen one day of the year...When we offer it as a service, there is an initial cost the customer has to pay but beyond that, it's all pay as you go." Pointing out that pay as you go is an integral part of the cloud offering, Kanda said, "It's available both in our public cloud and Cloud at Customer. We are bringing cloud behind a customer's firewall. We are giving them the same flexibility of payments as we offer them in the public cloud." Asked by Business Day if Oracle added flexible subscription pricing because of customer demand, Kanda said yes, explaining there were two reasons for doing so. "One is that the cloud offers the capability to the customer to pay for the service on an (as-needed) basis – they don't have to spend all the money up front. The second part, which customers expect with cloud, is flexibility of payment. Just like electricity at home, you pay as you use. Customers expect to pay only for their actual usage of cloud services." Cloud at Customer may be fairly new to the Caribbean, but since its introduction in 2016 it has experienced what Oracle described as "unprecedented growth, with leading global organisations across six continents and more than 30 countries adopting the solution, including AT&T and Bank of America." Kanda said public sector bodies are among the leaders in adoption of Cloud at Customer, including in Colombia and Brazil. "The Colombian Federation of Municipalities is adopting Cloud at Customer to modernise their municipalities. Similarly, we have customers in Brazil who are in the public sector. So we do see a good adoption of Cloud at Customer with the public sector (because of) security. They are carrying lots of citizen data and they want to ensure that, that data is maintained within the constraints of public sector data centres." Adding to Kanda's point about security, Eyre said Fujitsu has heard a lot about cloud security concerns, which is one reason why the company decided to bring Oracle Cloud at Customer into the regional market. "You can actually put your cloud platforms now behind your own firewall. This is one of the reasons why this technology is very important. You can have it on your premises or in Fujitsu's data centre, closer to you, with your own security policies, your own security, along with some of the Oracle security technology to be able to support it. That's one of the reasons we're actually doing this, to actually be able to give our customers a feeling of a safer route towards the public cloud," Eyre said.